"I really support the work you do at Downs Side Up..."
"BUT could you use the correct terminology when you refer to our children. It is Down syndrome not Down's syndrome." Now it's a little known fact that many moons ago I studied languages at university: French and Italian were my tongues, and I became an English tutor later myself. I also dipped my toe into Linguistics, which is the scientific study of languages and their form, content and meaning. I find it pretty fascinating to think about how languages are put together, how they evolve over time. 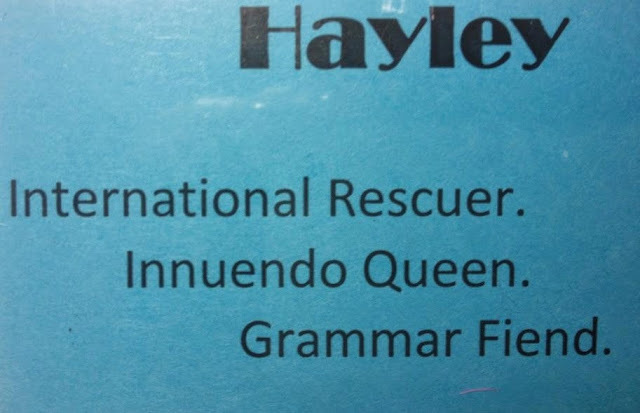 I have been labelled a 'Grammar Fiend' by one friend, who even made a badge for me to proudly wear, proclaiming the fact. I wouldn't say that I am a pedant. I mean I would never lick my finger to rub out an errant apostrophe on a chalk board outside a café selling ice-cream's. (Well, it was only the once). And it really wasn't me who crossed out the apostrophe on the advert looking to hire waitress's. (Honest gov). And I would never get out a biro to actually add in an apostrophe where one had been overlooked. It wouldn't bother me if I read a sign for childrens shoes for example. (Much). I am simply the kind of language lover who owns one copy of Eats, Shoots and Leaves. Well, OK, I have it on CD as well... and there is a small shelf dedicated to synonym and antonyms books, phrasal verbs in cartoon form and a few dictionaries and a smattering of etymology tomes in our house. And yes, English is complicated and there are many exceptions to every rule. That's part of what makes it such fun to use and study. Now back to language and individuals with Down's syndrome. It's one of the subjects I talk about at conferences. I highlight the danger of loaded language at point of diagnosis. I expand on how the way society refers to risks and bad news and the need for screening for parents' peace of mind and the way the phrase Down's syndrome is often in the same sentence as the word termination shapes our collective thinking. It's important stuff to me. I've worked with Lose the Label to focus on person first language. 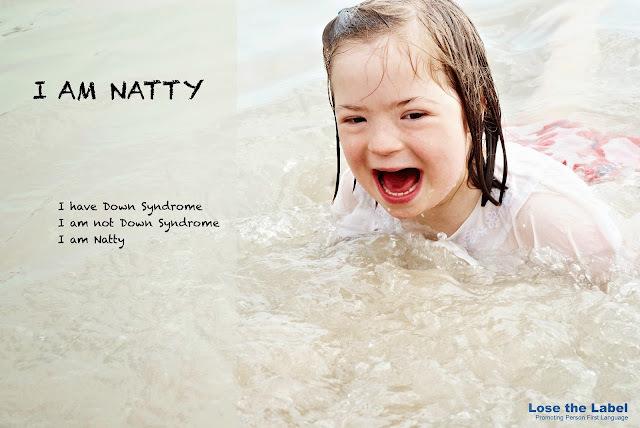 Natty is, after all, a little girl who has Down's syndrome. She is not a Down's girl, or a Down's. If I'd got that wrong I would have apologised with my hands in the air. I also back campaigns to end the use of words such as retard and mong. They are words that hurt, that demean those they refer to, that turn learning disability into an insult. They are words to get hot under the collar about. It's important stuff. Down vs Down's - Who Cares? But as it happens, this little matter of the variation in the way different countries write about Down or Down's syndrome around the world doesn't bother me. It's a matter of choice, of preference. It's a matter of geography. Many grey areas of English grammar are open to debate and subject to preference. I think this is one of those. So the irate reader's email really got under my skin. She's not the first, but she was the most vehement. How could she waste so much energy complaining vociferously about something so unimportant? Particularly when I was not wrong. I expect she has written similar emails, full of links backing up her case, to every charity and support group in the land. That takes commitment. And time. I told her that it wasn't important. That I respect the differences in our languages and that we have more important battles to fight together. You know, I say boot, you say trunk. I say rubbish, you say garbage. I say I've got, you say I've gotten which is a past participle that doesn't even exist in the UK. That's OK too. That's the evolution of language when it travels across oceans for you. I told her too that we have more important issues to worry about, like eugenics, and children locked in cages in Greece. Language has always changed over time. In 1500 Britain I would have referred to the place Edward lived as Edwardes house. Only much later did the apostrophe sit in place of an omitted letter, the e, becoming Edward's house. Many say this happened during the advent of printing, for ease apparently. 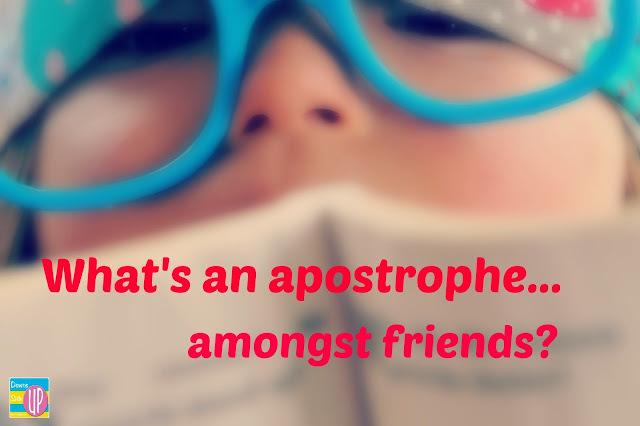 The apostrophe doesn't always denote possession of course, as we see in it's meaning it is but not in its cave as in the cave belonging to it. Anyway, my reader got crosser and sent more links and threatened to get all my American followers to unfollow me. Blimey, I thought, that's one determined apostrophe hater! Strictly speaking the 's is the traditional way of referring to any eponymous condition, disease or illness. In other words one named after a person. Toponymic medical names, called after places, such as Bornholm's disease follow the same convention and Legionnaire's disease is named after a social group. That means that the apostrophe denotes the origin of the syndrome, generally referring to a particular physician who first discovered or wrote about a condition, a much sought after accolade for doctors. I'm sure John Langdon Down would have been delighted to hear us talking of Down's syndrome. This is an example of the genitive case, which is easily confused with the possessive case. But it has nothing to do with possession. Note: It has nothing to do with the person owning the disease. See below examples of two weeks' notice and A Midsummer Night's Dream, also example of the genitive case, and not a possession in sight. Very few diseases are named after patients, who could be described as actually possessing the illness. I could only find three: Lou Gehrig's Disease, Hartnup Disease and Mortimer's Disease, and there is no consistency there. Hartnup didn't get an apostrophe. So we are still no further forward. and Huntington's chorea, amongst many others. That's a lot of medical journal rewrites! or Peutz-Jeghers syndrome to name but a few? The reasoning behind "since the author neither had nor owned the disorder" is a classic case of people incorrectly believing they are experts in linguistic issues just because they speak the language. Since this kind of naive nonsense was publicly declared in a resolution by educated people who should know they are only experts in medicine but not the relevant field, this is of course especially embarrassing. Any professor of English or any linguist could have explained to the US National Institute of Health that "possessive case" is a misnomer for the genitive case because this fulfils many more functions in English than indicating possession ("having" or "owning"). A two weeks' notice is not owned by the weeks and the same is true of a midsummer night's dream. This is called the classifying or objective genitive (see Genitive). The only (half) excuse for the missing genitive with "syndrome" is because one can't hear it before the word "syndrome", which also explains but does not provide justification for "parallel mentions on reputable sites of "Asperger syndrome" and "Asperger's disorder"
So, perhaps the US National Institute of Health didn't know their possessives from their genitives when they advised dropping the 's in Down syndrome? Or perhaps the 's had already been dropped in common parlance and they were seeking a concrete explanation as to why? Or, and I think this is where the truth lies, it is simply a question of pronunciation. Say it aloud... Down's syndrome/Down syndrome. You can't hear the difference, as the initial letter in syndrome blends with the end of the previous word Down/'s. It's called connected speech. So, the jury is out and the linguists will continue to debate and parents and support groups on either side of the world will pick their preference. But neither is wrong and respect is paramount. What is wrong is to say that because Langdon Down didn't have Down's syndrome himself it must never be called Down's syndrome. That is what I do believe we call codswallop here in the UK. What is also wrong is to write impassioned messages to campaigners/charities/bloggers about such trifles. And it is wrong to say that using the 's is incorrect - it isn't. I shall continue to adopt the British English way of using the genitive case to refer to an eponym, but I shall also use Down syndrome for its search engine benefits, or when writing for an American audience in an article. I doubt very much that those with Parkinson's disease are bun-fighting in the wings over an apostrophe, rather than sharing tips on ways to enhance life, do you? Now, let's work together to ensure a great future for our kids, a future where they are safe, given equal rights to education, healthcare and work, the right to vote and make independent choices, a right to freedom and a loving family. Let's work together to support each other, whether our kids have Down syndrome or Down's syndrome. What is important is our message and the drive to communicate that. After all, aren't we all working towards inclusion and the acceptance of difference.